The east exterior of the boat shed. Note the new tarp. A new door was custom built by my Dad, that replaced the old screen door. 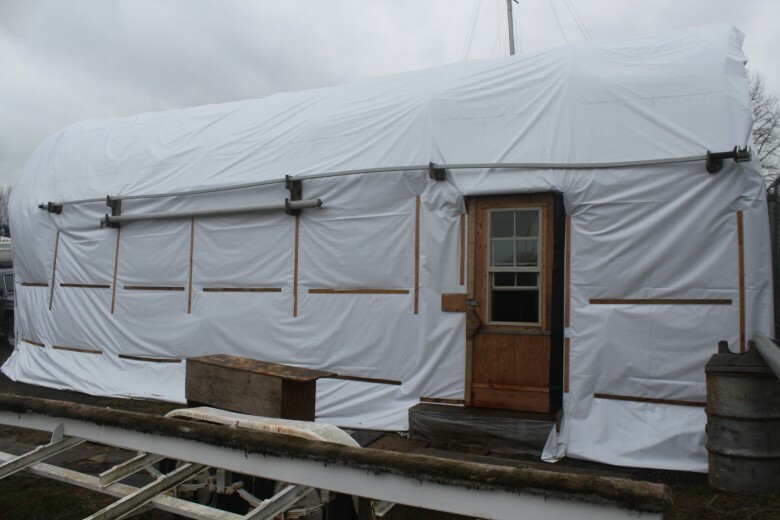 In late October, as the Pacific Northwest rain began to fall, it was clear the 2-year old tarp had developed many leaks and would need to be replaced. Since I knew this would be coming, I put a heavy duty ‘billboard’ tarp on order. The tarp has a UV inhibiter, 16 oz. weight and measures 40 x 60′. While the tarp was being delivered, I also took the time to review the boat shed’s structural integrity. After ~4 years out in the weather, it was showing it’s age. I found that a key support beam above the ‘tool room’ had cracked and would also need to be replaced. 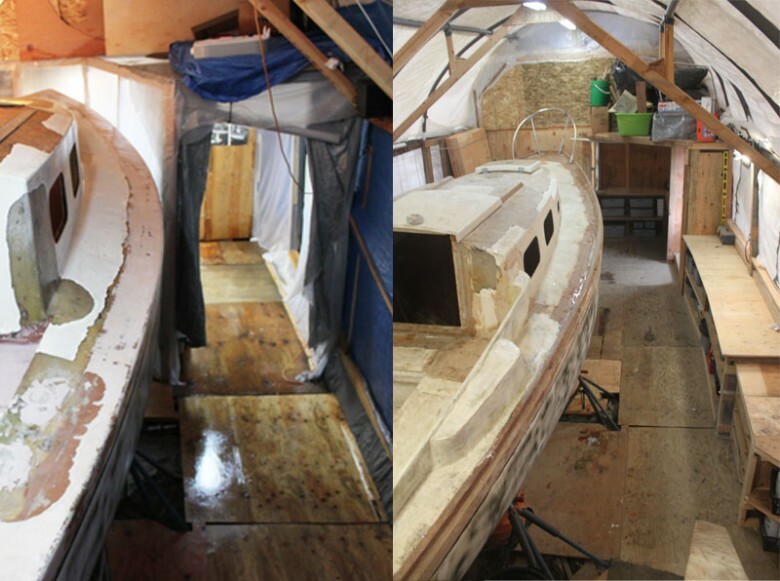 I also knew that sooner or later, I would need to remove the ‘tool room’ all together, so that I could have better access to the boat’s hull for body work and paint. As I continued to review and ponder, it became increasingly clear that the entire shed would need to be rebuilt from the inside out to gain access to the areas that needed repair, and to make way for the final projects that lay ahead. And so, begrudgingly, I began the process of completely demolishing the interior of the boat shed. Image comparing the boat area re-design. The old is on the left, new on the right. Note how much more space around the boat there is. Varnish room with extra wide bench and room for larger air compressor. Floor space around boat is much improved. 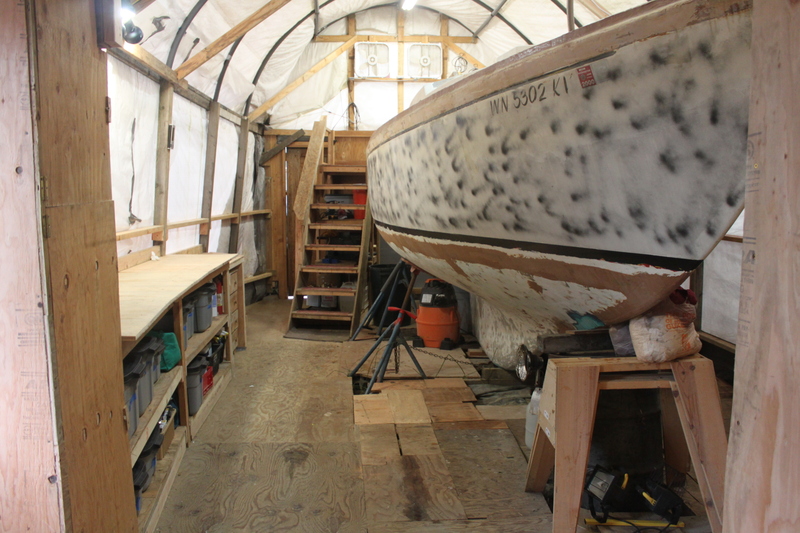 That darn spray paint on the hull though – I will sand that off as soon as construction starts again! 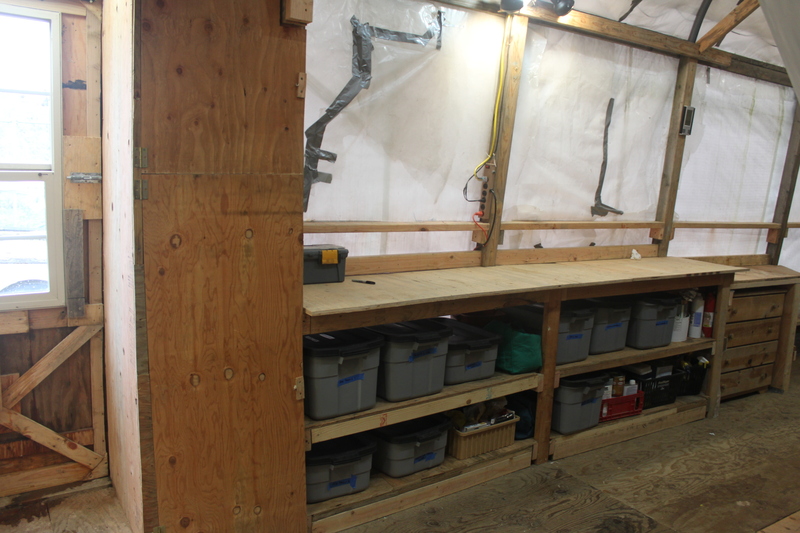 Long work bench and storage closet. With this construction complete, I’m now back in full research mode. I expect this phase to take some time (~7 months?). Then, once the research is complete I’ll purchase all the parts for the boat, and use the complete project list I generated during the research phase to step through each project in a logical progression. That’s a very nice well organized workspace. I wish I could do the same for working on my boat. What’s up with the black spray paint on the hull? Is that to make sure you don’t miss any spots when sanding it down later? Thanks for your comment. 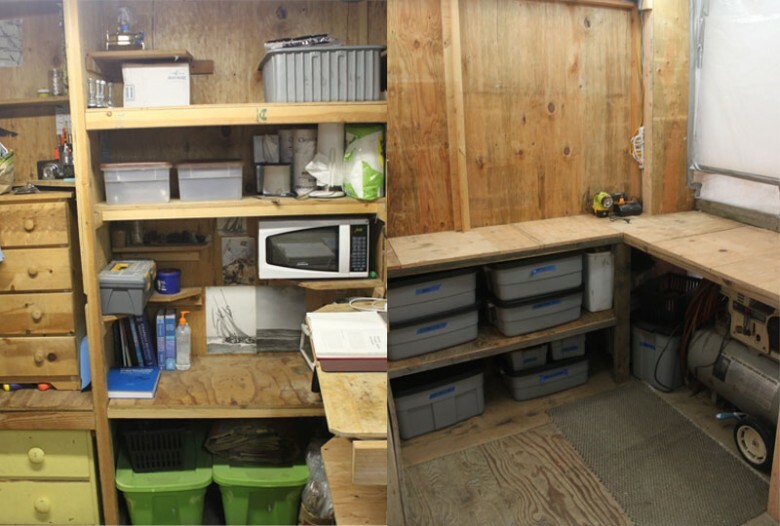 Yes, a work area is very important for a rebuild, but people set their areas up a lot of different ways and are successful. Regarding the spray paint, yes the reason was to not miss any spots. That was something I did very early on in the project. I think this suggestion was from a book I read, but forgot which one (maybe This Old Boat?). If I could choose again, I probably wouldn’t spray paint the hull, because I’ve now found that it’s fairly easy to see what has been sanded due to the marks from sanding. It will be really nice to sand off the black spray paint to see a nice white hull again! I also took the chance to check out your site. Looks like you’ve got a refit ahead of you as well. Fun stuff! I’ve subscribed via RSS so I’ll follow along. I bought the boat this past April. I’ve been wanting to get it in the water to use it and hope to very soon once I install a new seacock and reinstall the teak handrails when it warms up. I work in the military and found out I’ll deploy overseas again by the end of the year so I thought that planning a refit sometime after I get back (and possibly move again) would be a good idea. Andrew: Would appreciate some details about the tarp. Cost, supplier, weight, etc. Will need new one for covering mine next winter among other things. Also likely to come in handy with some work I’m doing with Habitat for Humanity. Shipping Weight = 105 lbs. This company was first on search results and I didn’t really research too many other vendors. So, you might want to look into other options as well. But, this has worked for me so far. Thanks. We have a local Canvas shop near us and that fits in pretty close with their info. The one I have now is from them. It’s 16oz. canvas and going on 14 years old. Just getting thin in some spots! I’ll look at your site, too. hi Andrew!Really long time no see!hope u still remember me! I’m busy preparing my coming examination!im goin to college!time flies ha! I’m your student in Shenzhen do u remember me? I miss u so much I hope u can see this and reply me with email! So seeing ur designing work is going quite well! I’m happy to know that ur life is very good! I shall work hard on my study too ! Looking forward to hearing from u my friend! Thanks for your note Kiki! Hope college is going well and stay in touch.